I've been waiting for, and almost dreading this day for a while now. Awaiting keenly because it signals the last major structural hurdle to clear in the garage, and dreading because I've neither done this, nor seen this done before. Speaking of blue gums, the first tree I selected as a pole last year (wait, 2011.. not last year!) was a beautiful straight trunk easily 15m long to the first fork. Unfortunately while I understood the principle of felling such a big tree, I was inexperienced in the detail and it ended up falling a good 150º from where I had intended. In the process, it pinched my chainsaw blade and split the log a good 6m before snapping and falling, onto my chainsaw. It survived, with a wonky bar which thankfully I was able to straighten using a little force and a few carefully chosen verbs. Anyway, we retrieved this split log last week in the hope it might be of use, but on closer inspection it turned out to be far too badly split to use as a pole in its own right. Being so broad however, even though it was flat on one side it was still plenty strong enough for our purposes and a little lateral thinking had it chosen as the poles which run alongside the shipping container. It's flat, so is the log.. snap!! So with that decision taken, Peter set about cutting it to length. I must say, there are few things more satisfying than a sharp chainsaw chain. For that matter, there are fewer things more frustrating than a blunt one too! While Peter kept himself busy cutting logs to length, I set about drilling and bolting the bottom retaining brackets into place. These are simply 100x150x10 steel angle with the long tongue finding home in a 20mm slot cut into the base of the log, which we'll anchor to the bracket using some 12mm reo bar spikes. Here's the first one going up. This one we ratchet strapped (of course!) to the teeth on the bobcat bucket, and then lifted it vertical. Quite by accident (!) I discovered that the bobcat will actually lift the poles clear off the ground this way, a useful discovery when it comes time to lift the central garage poles into place. With only minor adjustments, it slotted home onto its bracket beautifully. The bracket and its retaining nuts actually keep the log sitting a good 25mm off the slab, which can't be a bad thing. Eventually I think I'll fill this gap in with an earthy-coloured mortar, just to keep things neat. To secure it into position temporarily, we tek-screwed it from inside the container but these will be replaced with sizeable coach screws and load-spreading washers. The second pole went up quite a bit quicker than the first. This time we dispensed with the ratchet strapping and simply lifted it into position with the bobcat bucket. I'd originally decided against this technique fearing that the bucket teeth would damage the timber, but quite honestly these logs already have so much "character" that if the teeth did leave an impression, I can't see it. With the two posts up and secure, why wait? time for the beam! The first end was lifted up onto the shipping container suspended from a couple of ratchet straps, tied to the bobcat bucket. Pretty easy (slow) going actually, although when you consider that the log probably weighs half a tonne it's easy to take the strength of the bobcat for granted! With one end up, the other was pretty straightforward - get it into the bobcat bucket and drive it forward while lifting to height. Once up, we needed to pivot it around into position - again, pretty easy with the bobcat and a crowbar. 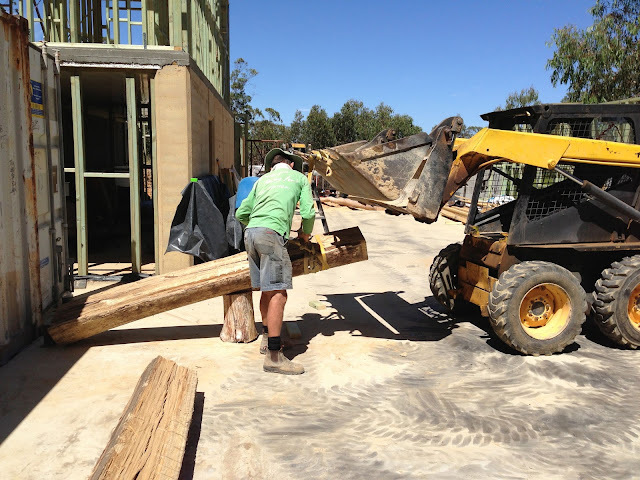 With the log in more-or-less the right position, Peter set about cutting trenches in the bottom face in order that it sit flat on top of the already-dressed posts, and to bring the top surface of the log close to the height required to take the roof trusses. By design, we'll need to trench the top of the log slightly for each truss to give us the ability to fine tune its height. With the log trenched, we simply rolled it from on top of the container onto the top of the posts, which had a couple of retaining timbers attached to prevent the log from over-rotating. Although this sounds simple, this part of the job took most of an afternoon with the tweaking and fine tuning of the beam's position. We rolled it back off twice before we had it adjusted to just the right position. By this time it was getting quite late and so after a few little prep jobs for tomorrow we called it cider-o'clock and downed tools. One frame up, one to go!